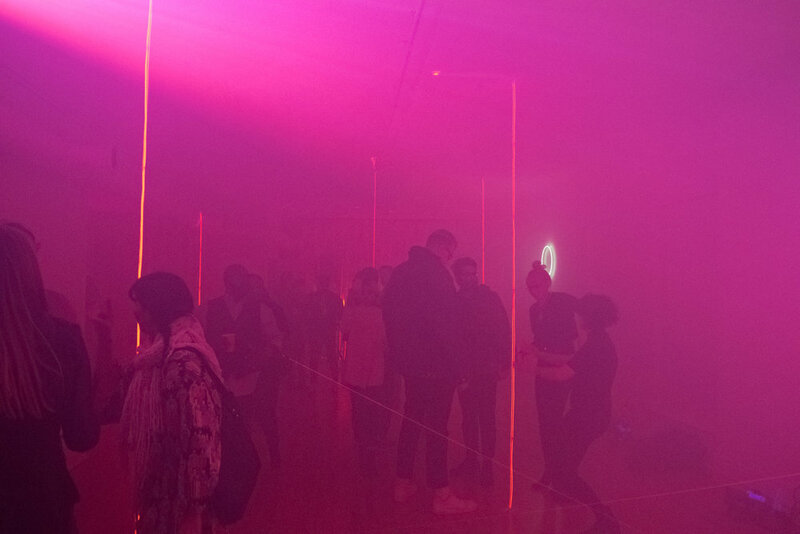 Space Becomes You is a multifaceted installation by the Wicker Park-based artist collective Someoddpilot. The exhibition was designed to display the group’s first capsule collection comprised of three elements: a photobook, a clothing line, and a short film. Someoddpilot’s background as a major brand-development agency well prepared them to create a unique thought culture and visual aesthetic to be emphasized across multiple mediums. The combined efforts of the artists have resulted in the transformation of the group’s own Public Works Gallery into a space that embodies and promotes a cosmic cult-like mentality. SOP’s Creative Director, Chris Eichenseer suggested that the same stardust that existed at the creation of the universe remains a part of the universe today. It is this line of thinking that acts as a thematic thread throughout the collection. To create their story, SOP repeats visual and linguistic elements across mediums. A neon sign above the clothing rack reads the phrase “YOU CANNOT BE DELETED,” which is also printed on the front of the crewneck sweatshirts hanging on a rack below, occurs across from imagery within the photobook, and appears on screen during the film. Images from within the book are displayed throughout the exhibition space as 20” x 30” inch framed prints that completely occupy one’s field of vision when fully faced. A fossil that is on display in physical form is also an image in the book and hangs framed as a print on the wall. The exhibition is undoubtedly a fully immersive experience. In this way SOP’S culminated ideology is cemented in the mind, and a heightened importance is given to the art objects and phrases that viewers are presented with. The photobook and film give face and narrative to the collection. The portraits within the book and on the walls are reminiscent of fashion portraits containing “models” but with a futuristic and alien-like glamour to them. They appear to be human, but often their physical forms are mirrored, widened, or altered in some way. Their appearance incites a transfixed curiosity. The portraits are also displayed in relation to simultaneously familiar and unfamiliar landscape scenes. An image of a shoreline has a liquid mercury-like mass floating off to the side, and another a spherical ship. This combination of natural and “unnatural” imagery is even more prominent in the film. It begins at the waterline, which is positioned at the top of the frame rather than the bottom, so that a figure submerging from the surface is viewed upside down. Human figures walk as a similarly clothed group to a dock and slowly start to ascend toward the sky. A young boy stares at a screen and his eyes begin to glow. It is this visual play that is contemporary myth-making at full force. After taking in the messages of Someoddpilot’s myth, one can physically manifest it with pieces from their first gender neutral clothing line. It consists of 8 similar yet different t-shirts and pullovers. They are displayed as part of the exhibition with simple/ minimal text on the front and collage-like graphics seen in the book as larger designs on the back. The uniform for those ascribing to the myth. The 300-page photo book that encapsulates the exhibition will be released April 2019.